Two energetic residential apartments overlook a tree-lined piazza between 5th and 6th street at the new Bowden development. At four and five storey’s respectively, Luminaire caters to a wide-range of residencies - from studio to 3 bedroom - revealing themselves within the striking facade that draws on the Industrial topology of the former Clipsal Electronics site. With Luminaire apartments Tectvs provided the spark to light up the burgeoning site, redefining city living in a suburb that will eventually be home to 3,500 residents. Harkening back to similar techniques used in industrial brick making, Tectvs drew on the heritage of former Clipsal factory site by working Luminaire’s aesthetics with industrial rigour. Stacking, stepping and framing became key form generators, surfacing bold geometries into the materiality and form of the facade. The re-appearing forms were coloured, with windows variably and contemporarily inserted to render a postmodern overlay of geometric elements. Stacking, stepping and framing became key form generators, surfacing bold geometries into the materiality and form of the facade. Inside, light is key to the high quality of amenity in the end-product. Designing light into open-plan living and bedroom spaces drove the program of the building. Rather than being corridors, the central passageways are treated like bridges in the sky. Individual apartments are governed around full width balconies of a generous 2-2.5m depth, allowing them to function as outdoor rooms. Communal corridor spaces are bathed in brightness from light wells. 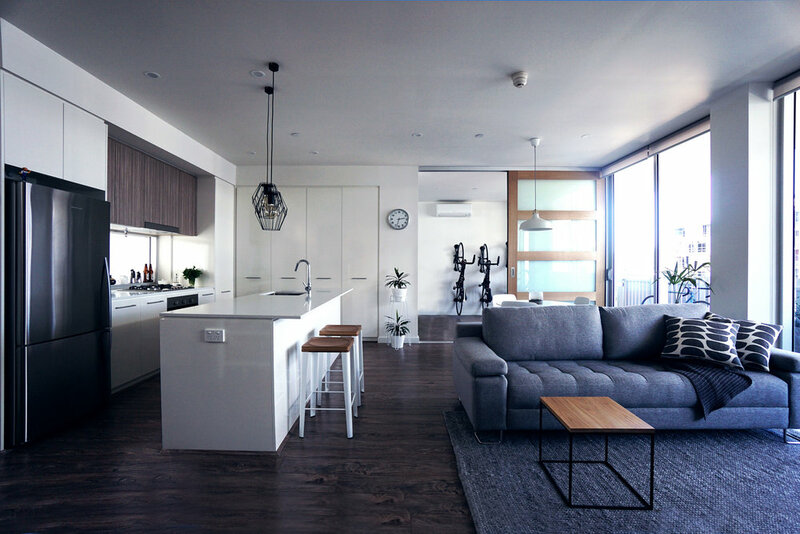 Natural light is coupled with a mix of active and passive ventilation strategies to provide a comfortable living atmosphere and a 5-star greenstar rating. The success of the form is underpinned by a semi-depressed, semi-naturally ventilated basement parking undercroft; a simple engineering solution which has allowed activation of the ground plane in-line with Bowden’s community atmosphere. Situated at a key arterial entrance, Luminaire's 87 apartments and generous central plaza presents the developing Bowden precinct with design confidence to set the conversation high on the future of city living.